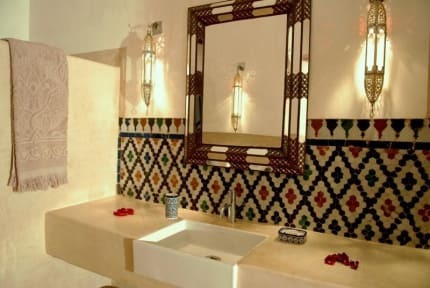 Dar Bensouda has two beautiful courtyards : the fountain courtyard around which eleven luxurious rooms and suites are arranged; and the swimming pool patio with a leafy garden, Each room is individually decorated, air-conditioned, and has an en-suite bathroom with shower. The suites have a bathtub and a relaxing sitting room. The large roof-terrace of Riad Bensouda has sweeping views over the Medina and offers you various relaxation areas such as the traditional Moroccan tent and an upper terrace with a panoramic view of the Atlas Mountains. Moroccan cuisine is one of the most refined in the world. The colorful presentation of well-prepared national delicacies makes dining a pleasure for gourmands! Taxes not included - occupancy tax 25.30 MAD per person per night.